GIS helps people access, interpret, and share information faster and easier by organizing data geographically. GIS in the petroleum sector is in delivering easy-to-use digital maps that enable oil company staff to see what data is available to them, so that they can drastically reduce the amount of time they spend looking for the information they need to do their work. Often such maps are delivered using web-based GIS applications that require little or no training to use, and show all data of interest side-by-side in a single interface. GIS stores information as attributes allows a land man to map key lease data such as lessor names, lease expiry dates, working interests (WI), overriding royalty (OR), overriding royalty interest (ORRI), net revenue interest (NRI) and gross/net acreages. An emerging use of GIS is in using flying sensor technology to gather on-demand high resolution imagery across a field location in order to survey a site. This allows companies to regularly monitor sites and to identify and manage change, without having to commission expensive satellite data capture. The power of GIS is magnified by its ability to compare and analyze multiple data sets. 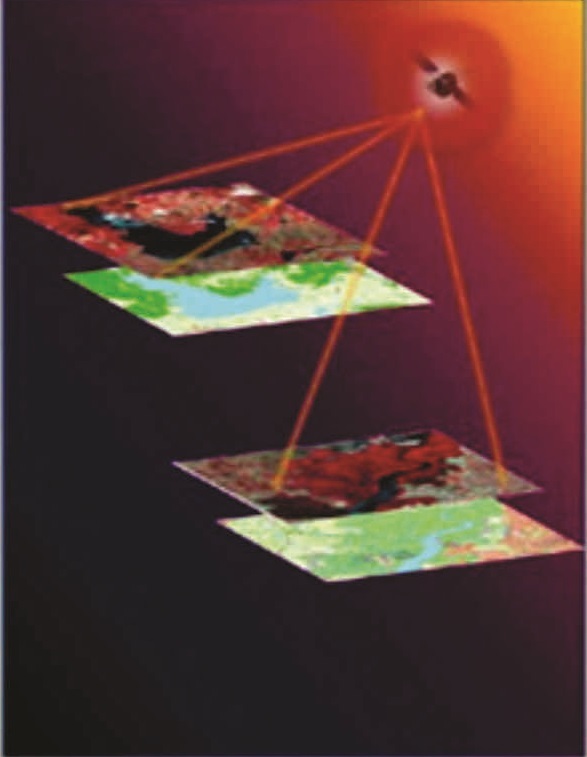 GIS Helps in Land Survey at Major crossings such as National highway, state highway, Railways, Canals, Rivers, HDD. 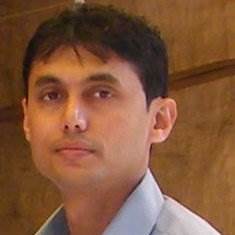 Saurabh Varma is associated with Science and Technology Park, Pune as a Project Associate since 2008. He obtained his M.Tech degree in Remote Sensing and Geographical Information System (GIS) from Indian Institute of Remote Sensing (IIRS), Dehradun an ISRO Training Institute and from the Geo-engineering Division of Andhra University. Saurabh shall be introducing Basics concept of Geographical Information System and its Application in different fields in todays world, along with reallife examples drawn from projects.Saurabh provided key GIS inputs for the GIS based CGD Network Design at both Pune- MNGL & Dewas - GAIL GAS Ltd.
Dr. Himanshu Ranade has obtained Ph.D. Degree in Environment Management. He is currently associated with Geo informatics Cell, Science & Technology Park, Govt. of India in the capacity of Project Associate since last 7 years. At GUIDE, he was involved in biodiversity mapping project for Kachchh region that was funded by Ministry of Environment & Forest (MoEF) for the tenure May 2004-May 2005. He also gained field experience of working in forest ecosystems of Arunachal Pradesh for IIRS under ISRO-GBP project on Carbon Budget assessment of terrestrial ecosystem of Arunachal Pradesh during June 2005- June 2006. Subsequently, He was also engaged for two years (July 2006-May 2008) under National Land Use Land Cover mapping of Bihar State that was sponsored by National Remote Sensing Centre (NRSC), Hyderabad to Geo mastics Solution and Development Group, C-DAC, Pune. The Science and Technology Park is an institute set up jointly by Department of Science and Technology, Ministry of Science and Technology, Govt. of India and University of Pune in the year 1988. It is registered under Societies Registration Act, 1860 bearing registration No.12709 dated 25th May 1990 as well as under the Bombay Public Trusts Act, 1950 bearing registration No F/6184/Pune dated 7/ 7/1990 and having its registered office at University of Pune Campus, Ganeshkhind Pune 411007. Scitech Park acts as an interface to bring complete cohesion between the researchers & industry to work for mutual benefits and for benefit of the society at large. It works as a nodal agency to provide training and consultancy services to various government, public and private sectors. It is also involved in giving need-based training to researchers, entrepreneurs and industries by using resources in terms of manpower and infrastructure of the University and various national and state institutions. 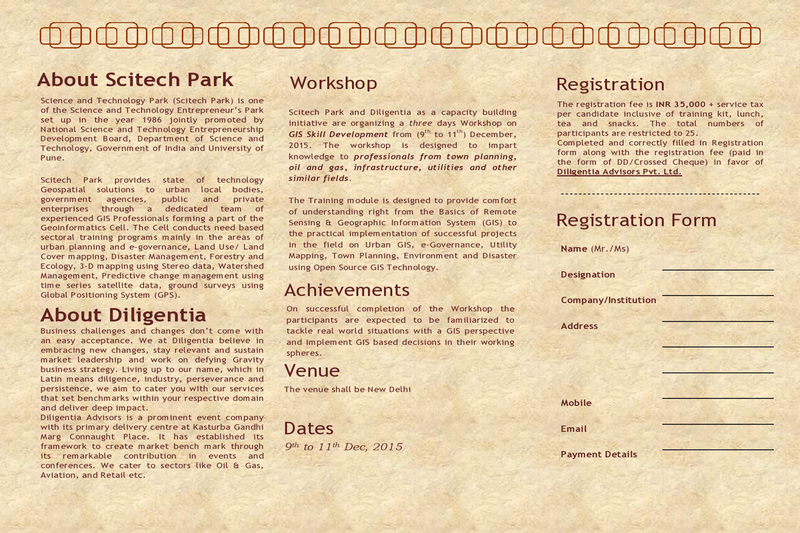 The promotion of high-tech entrepreneurship based on indigenous knowledge is one of its prime objectives. Very good training on web based/ open source GIS. This will definitely help us in implementing the same in our business. 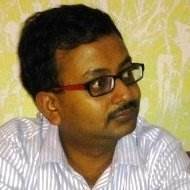 Sandip Kumar Parihar - Sabarmati Gas Ltd. It was an excellent venture on the part of scitech and Diligentia jointly and very timely. The training was helpful for my current job profile. Overall the quality of the course content is good and helpful in nature.